The new economic numbers are out, and they are spectacular. The growth in the economy is accelerating. Last month, more than 223,000 new jobs – almost 50,000 more than economists had projected. The inflation rate has held steady at around 2 percent. Significantly, unemployment dropped in 305 of the 338 major urban areas characterized by chronic unemployment – especially in minority communities. Both the Black and Hispanic unemployment rates have reached historic lows, although inner city minority unemployment remains above national averages. The current dollar Gross Domestic Product – America’s economic growth has run over 3 percent for the past quarter and hit 4.2 percent in the most current report – a level that critics not long ago said was totally unattainable in the short run. In fact, they predicted that the GDP would not even reach 3 percent in the foreseeable future. You must give the #NeverTrump Democrats and the media credit for persistence. Even after the Trump presidency has been in office for a year and a half – and been in the transition period for another two months – the unbridled left keeps insisting that all this spectacularly good economic news is merely the continuation of the Obama policies. Of course, as each day goes by and the numbers keep improving across the board, the #NeverTrump folks are losing credibility – a credibility they never deserved in the first place. 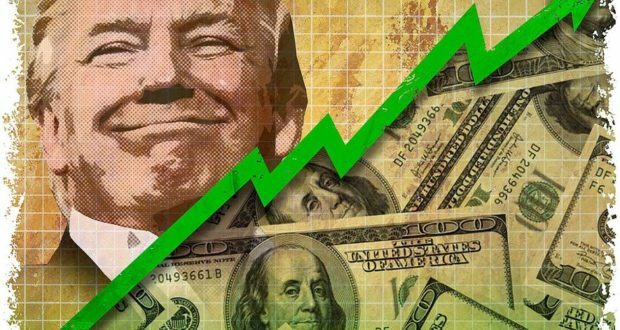 The economy is actually in better shape than most people may realize because the anti-Trump press uses every shoddy journalistic gimmick to spin negativism into every bit of good news. If job creation is higher than expected and unemployment is at record lows, the press will dwell on slower progress in increasing income levels or the number of people who have fallen off the unemployment rolls during the Obama administration but still need jobs – and even those numbers are improving. Interestingly, during the limp Obama recovery (the slowest in history) the same media that uses these lagging indicators against Trump totally ignored the numbers of people dropping out of the job market and the stagnant wage levels during the Obama years – pay levels that were well below what was referred to as living wages. Under Obama economic policies, the nation never achieved a three percent growth in the Gross National Product in any of the 96 months Obama was in office. That lower growth rate meant that America could not reduce unemployment significantly and could not generate sufficient tax revenues to avoid an $18 trillion increase in the National Debt. The American economy had straight-lined in critical condition. Before addressing the specifics of the Trump economy, it may be useful to review the old projections. At the time Obama won approval of the extraordinarily expensive “stimulus package,” he publicly promised that the economy would hit a six percent growth rate within six months. The Obama administration assured the public that his namesake Obamacare would not only reduce premiums and medical costs but would not impact negatively on the general economy. Both claims proved to be untrue. We should also remind ourselves that the Democrats and the media – in flagrant partisan fearmongering – predicted that the election of Donald Trump would crash the stock market. In fact, it rose on the news of Trump’s election. Just the prospect of promised tax cuts and a meaningful program of deregulation was sufficient to cause an immediate anticipatory rise in stock values. The Trump economy was born. What ended on Election Day were the economic policies of the Obama administration that had kept the American economy in suspended animation in the two percent growth range and the removal of the fear that a President Clinton would continue in the Democrat/Obama tradition. To say that the “good news” economy was merely a continuation of Obama policies denies a number of central facts. Trump and the Republicans made fundamental changes to those Obama policies that had been largely ineffective over the long haul. Almost immediately, the election created a pervasive air of optimism in the business sector. The psychological effect on the economy is a well-established reality. If the markets believe the business environment will improve in the future, it creates an immediate positive reaction. Such anticipatory reaction was also seen in the “consumer confidence” indices. When the public “feels” more confident in the future of the economy, they spend more. It is a form of self-proving prophesy. The fact that polls show that two-thirds of the public now believe the nation is heading in the right direction – as opposed to the two-thirds who believed it was heading in the wrong direction at the end of the Obama administration – is part of the psychological effect. But it is the substantive policies that eventually drive the market. The promise of things to come will only go so far. The tax cut was a major stimulus. The Democrats claim that the tax reductions were gifts to the rich is so untrue as to be contemptible. To make that bogus claim, the left argues that cuts in corporate taxes merely benefit the millionaires and billionaires – those one-percenters that socialist Bernie Sanders despises so much. First, we must understand that businesses never really pay taxes. It is merely a pass-through expense to the consumer. While we talk about the impact of tax increases affecting prices on gas and cigarettes, we seem to forget that the same applies when we buy a shirt or hire an accountant – or even rent an apartment. Tax cuts in the competitive business marketplace produce two positive results – lower prices and more hiring. Yes, some can go to executive bonuses or buying back stock, but competition eventually requires price adjustments and more workers. Businesses that fail to respond with lower prices and higher employment will suffer from a loss of market share. The tax law also did something else to power the economy – something not done under Obama. Trump did away with the tax policies that discouraged major businesses from repatriating trillions of dollars held overseas. That is another source of taxable revenue and a case for domestic investment – meaning capital improvements, lower costs and more jobs. We also tend to think of business as multi-national corporations when, in fact, the majority of job creation happens at the small business end of the continuum. If you convert employment statistics to a graph, it would be a very lopsided bell curve. The Republican tax cut has been a boon to small business – both in reducing the tax burden on the business AND on the personal returns of the moms and pops who run them. The cost burden of regulation on major corporations is enormous – and we consumers pay for it. It is particularly destructive on small businesses that cannot survive the increased costs. They lack funds for complex and inconsistent compliance requirements. Excessive regulation destroys small businesses and discourages startups. Since small business is the backbone of the American economy, the impact of regulations is more destructive – albeit less obvious – than on the major corporations. Deregulation is happening largely out of the lens of the media. They may occasionally report negatively on the concept or highlight some deregulation they can spin into a seemingly negative story, but they simply cannot follow the volume of regulations being eradicated by scores of Cabinet members and senior staff. And yet, many business leaders see deregulation as a more effective stimulus than the tax cuts. The unburdening of tens of thousands of excessive regulations produces savings that, like tax cuts, translate into price reductions and more hiring. This is a complete reversal of the Obama approach to regulation that was hindering economic growth. This is clearly a Trump effect. In his earliest days in office, Trump ordered that a minimum two regulations be lifted for every new regulation that is imposed. At one point, the actual ratio was the elimination of 16 regulations for every new one. Thousands of regulations have been removed without much, if any, negative impact on health or safety despite the caterwauling from the left. Larry Horist is a conservative activist with an extensive background in economics, public policy and political issues. Clients of his consulting firm have included such conservative icons as Steve Forbes and Milton Friedman, and he has served as a consultant to the White House under Presidents Nixon and Reagan. He has testified as an expert witness before numerous legislative bodies, including the U. S. Congress and lectured at Harvard University, Northwestern University, Florida Atlantic University, Knox College and Hope College. An award winning debater, his insightful and sometimes controversial commentaries appear frequently on the editorial pages of newspapers across the nation. He can be reached at lph@thomasandjoyce.com. Thank you Mr. Horist for the insightful column. Sooner or later the truth emerges and the market reacts accordingly, not through the biased lens we see in the media. Mr. Obama had no background in which to understand, let alone make decisions concerning the economy, regulations, trade, or tax policy. It clearly showed in the outcomes his administation produced. He now seeks to live off the success of others by narcisistic preening, deceit and deception. His legacy produced eight wasted years that had the nation on the road to ruin. President Trump is not the slick orator that Mr. Obama is, but I’ll take his results any day of the week. President Trump’s detractors are jealous of his administrations’s accomplishments in such a short period of time. Leaders lead, and are not afraid of the consequences in the court of public opinion. Have you met the new Amazon of Africa?